The Truth About Binary Options – Legit Trading or Scam? The following is a guest post about getting out of debt. If interested in submitting a guest post, please read my guest post policy and then contact me. What’s worse than feeling burdened by debt? Having to pay interest on the debt you’re worried about. Interest can add a huge amount to the principal of your debt, and having to write out checks that reflect that can be painful! That’s why you’re no longer interested in paying more interest than you need to. In fact, you’re ready to look that loan interest in the eye and tell it like it is – some serious changes are on the horizon. That means paying as much as you can on high interest loans, and minimums on the rest. That means making bi-weekly payments. That means – you’re more than ready to move on from your interest charges. Sure you want to get out of debt, but you know achieving your goals means more than just getting out of the red zone. It means having a plan, an end-point and importantly a clear idea of where you’re going and what’s motivating you. Why do you want to get out of debt? To finally take that vacation you’ve been wanting to take? To enjoy a meal out without feeling guilty? To make significant contributions to your savings or your retirement? Whatever the reason, you realize the importance of highlighting your goals and using them as motivators for your financial plan. Not only have you established your goals, but you’re ready to visualize them. And that doesn’t mean just thinking about tomorrow and taking it bit by bit. You know a marathon is made up of small steps, but you’ve still got your eyes out on the road ahead – maybe even on the finish line. Long-term goals are helping to shape your short-term goals. after-all, the one depends on the other. Paying off your debt will free up cash that can help with your other longer term goals. You’re ready to get out of debt, and you’ve told people about it. Now, you have a cheerleading team chanting your praise. Achieving a debt-free future is hard enough on your own, but assembling a rallying superteam to help cheer you on along the way is a certain boost to your progress. Nobody wants to disappoint the cheering fans on the sidelines! So you’re taking full advantage of your support system, and using their energy to propel you towards your financial goals. You love your rental, but the landlord isn’t keen on the idea of you remodeling the kitchen. Just like they aren’t into the idea of adding a trampoline room, or turning the living room into a tiny ice skating rink. But even if their rental contract doesn’t give enough leeway for your creative ambition – you’re OK with that. Especially since you’re already using your imagination to plan out your own potential home. Once debt is out of the way, you’ll be able to focus even more on the idea that you might have a house of your very own. It started with a little cost cut here, a little saving there and all of a sudden you’re bragging about your successful budgeting just like you bragged about beating that video game level. Though budgeting gets a bad rap, you’re kind of digging it – and you’re also kind of excelling at it. No longer do you leave your bank statements unopened, or crumple your receipts. They’re necessary accessories for your budgeting plan! And not only is budgeting a new hobby, knowing where your money goes is helping you on your way to paying off your credit card debt and student loan debt. You’ve got the tools to organize your finances and you’re ready to use them. Organizing your debt payoff, digital updates and a way to streamline the process of efficient payments – you’re not only happy to be working towards a debt-free future, but the designs are kind of fun too! And to boot, life’s easier when you utilize tools to help payoff your debt and relieve some of the pressure on yourself. Nobody would even guess that your middle name is Earl considering how responsible you’ve become with your finances. You’re taking charge of your finances, setting priorities and actually sticking to them. Not only have you decided to get out of debt, you’ve learned that you’re the one who has the power to do so. “And with great power comes great responsibility”… you’ve also realized that it never hurts to use a Batman quote to motivate you. You remember the moment you asked yourself “With a name like ‘free time’, why are my weekends costing so much?” And you remember deciding to do something about it by turning some of your free time into paid time. Adding billable hours for side projects, picking up a few hours at an extra job, or putting your specialized skills to use – all ways possibilities for bringing in a bit of extra cash and chipping away even faster at your debt. Ah – sandy beaches, clear waters. You can almost feel the warm breeze on your face. Why almost? Well, because you’re staring at your screen-saver. But that’s OK, because you’re planning for an early (or earlier) retirement and you’re doing everything in your power to make it happen. That includes paying off your debt early and contributing regularly to your retirement fund. Soon enough, you know! Soon enough. OK – so maybe you haven’t exactly experienced all of these top 10 reasons personally – yet. But there’s no reason you can’t! Even if ‘you’ don’t fit into all the above scenarios, you have the potential to take control and keep up the energy towards your goal of becoming debt free. Simple switches in perspective and frame of mind can be powerful as you continue or begin to tackle your debt! So let’s just go ahead and make the assumption now – you know you can do it. 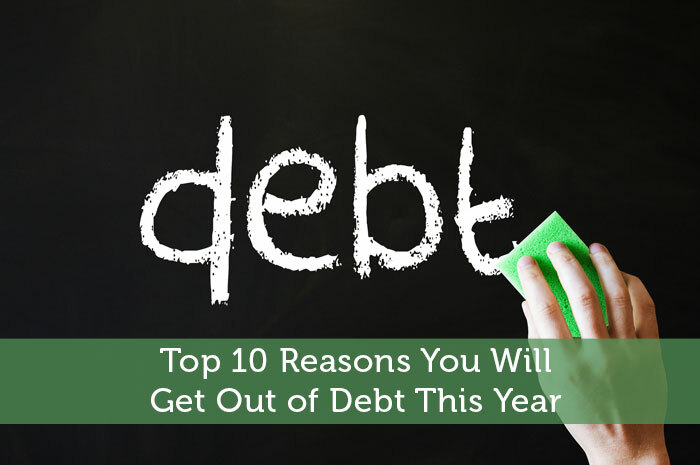 Or are you unsure how to get out of debt. Author Bio: Claire Murdough is a Bay Area native with an affinity for travel and food. She is a personal finance writer at ReadyForZero. Has Boeing Stock (BA) Finally Bottomed Out? I totally hear you on #1!!! My husband and I always remind each other that “we want interest to work FOR us, not AGAINST us” whenever we are tempted to pull out the plastic to pay for something we probably can’t afford. Yes – that’s a great way of looking at it!!! The moment I realized just how much I was paying in interest was the moment I resolved to speed up my repayment plan. Love this. You absolutely have the power to take control. Recognizing that rather than feeling victim to debt is the most important step. Thanks for the comment Stefanie!! Taking actions to pay off debt can feel impossible when you’re in the thick of it, but regaining the power is SO motivating. It’s forward motion!! I definitely won’t be getting out of debt this year but #1 is my main motivator. I hate interest! I’m still working on making #9 happen to see more progress. But when you’re in as much debt as I am, it’s a long, slow process. Debt repayment is certainly a marathon affair. But hopefully keeping interest expenses in mind will keep you motivated. In my repayment, that specific pain point has really kept me focused!! This is a great list! I think that having clear goals and a support network are probably the biggest keys to success. It is difficult to achieve goals without a specific plan. And getting out of debt is sometimes a long and arduous journey and if you do not have positive support along the way, it is easy to get sidetracked and distracted. I think my favorite part of the process is the extra support I get when I’m feeling stalled or unmotivated. The big hurdle for me was opening up about my debt, but that led to such a supportive financial network! Thanks for reading!! #8 is the big kicker for Mrs Warrior and I. With the new Little Warrior in our life, we want to set him up for the best (not spoiled) life possible and want to share as many memories with him. That means us doing everything we can to rid the debt (almost there), save, invest, and create more income streams. We want to be early retirees so taking the financial responsibility over our life is critical to that end goal. What a lucky little guy! Congratulations on your progress and I’m excited to keep checking in on your successes! I love the positive tone of this post. If you don’t believe you can get out of debt, it won’t happen. A goal is a great motivator but having a positive outlook is so important to keep up the momentum. Thanks for the comment Kim! I am not in debt but I love this post. I think as a reminder it should be said after #10, stop buying things you can’t afford. Great tip! Such a crucial part of achieving (and maintaining) a debt free lifestyle. I can’t imagine having to try to pay off debt without a support network. I think it would be much more difficult without one! I love it! Giving hope to all the non-Earls! I like it! An excellent positive focus. Too many people get discouraged in the last quarter of the year. Loved this post! It’s a great list and great motivator! Great list. I think homeownership is really my motivation to be responsible with money and I just hate being in debt period so I’m trying my best to fix it. Thanks Romona! Definitely a great goal to have. PS I just browsed through your blog – love it! I take a huge responsibility for all of the debt I have incurred over the years and I hope to pay off one thing at a time and work my way done the list with my student loans being the final straw. loved this! WE have about 10k in 0% interest debt and while it makes sense to keep our money in the bank earning interest, the lure of just being debt free is so much more appealing! that’s why we hope to make one bulk payment in January and just be done with it and start fresh. Points 4 and 6 apply to me! I’ve developed a support network online that is pushing me to achieve my goals. I never would have expected that but I’m so grateful for it! And budgeting is definitely my new hobby – I look forward to going through my receipts?! Haha, budgeting is a new hobby, so true! I’m neurotic about our spreadsheet! Retiring early is definitely a motivator to clear debt. Having freedom and not making those irritating monthly payments is also a bonus, I cant wait to see the back of my credit card. Cheerful post, thanks for sharing. The Truth About Binary Options - Legit Trading or Scam? Get Your Free Investing Course and Tips Now Start investing smarter! © 2018 ModestMoney.com – All Rights Reserved.